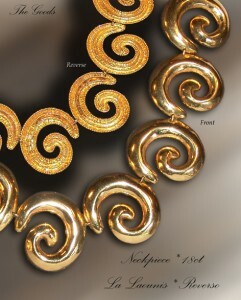 Magnificent Neckpiece from the Lalounis Studios. Known for his Archeological Revival style, this rare neckpiece can be worn either side out, in a "day-night" manner with the warmth of finely beaded yellow gold or the bright flash of sunlight. With over 180 grams of 18ct gold, either way it leaves an impression of elegance you will never tire of. Presented in its original box.